Enjoy compositions by the composers J.Pachelbel, W.A.Mozart and A.Vivaldi played by the famous Prague Royal Orchestra at St. Georges Basilica, Prague Castle. The Prague Royal Orchestra was founded in cooperation with the National Theatre and the State opera House and is formed of highly experienced professional musicians from The National Theatre, The State Opera House, The Czech Radio, The PragueSymphony Orchestra and the Czech Philharmonic Orchestra. From the date of itsformation it has featured as part of both Czech and international musical culture. Under the baton of the conductor, Mr. Jaroslav Vodnansky it has performed numerous successful concerts in USA, Japan, and South Korea, as well as in most of European countries, including Germany, Austria, Switzerland, Denmark, Belgium, France and Spain. Book your seats online now - just print out your E-Ticket you receive via email after your purchase and go to the entrance! Classic Concerts Tickets sells tickets according to the “first come - first serve”, within the seating sales categories. You receive your seats at the entrance all together. The purchase of tickets is fast and comfortable. Choose Date and Time, Category and Amount of Tickets at the right top on every events. Click on Order Tickets button to show your shopping card. If your order is ready click on " Order " to proceed. After ordering your tickets you receive your E-Ticket Voucher including booking number via E-mail. Print your E-Tickets and take it with you!!! If for some reasons you will not get E-tickets atached in pdf. format you can use your confirmation of payment with your ID number as tickets. This confirmation you will receive after your succesful payment. ON SITE : Just go to the entrance and show your printed E-tickets at the door. Thats all. You may be asked for your ID card at the entrance. There is no neccesary any exhange of your printed E-mail tickets. All important informations about your event you will find on your E-mail ticket. Prague Royal Symphony Orchestra and classical concerts in Prague. Ballet performance in Prague. Our offer includes classical concerts in Prague and Prague ballet performace organised in historical and culturally precious places (e.g. Theatre Hybernia, Municipal House, Rudolfinum, Prague Castle), which you should not miss while visiting Prague, capital of the Czech Republic. ALL CONCERTS HERE ARE ORGANISED BY US. PRICES ARE THE SAME AS THE THEATRE BOX OFFICE. NO EXTRA FEES ADDED. Upcoming Prague classical concerts and Prague ballets at Smetana Hall, Municipal house, Theatre Hybernia, Betlehem chapel, St.Martin on the Wall church and Prague Castle. Perfect choice from classical concerts in Prague and ballet in Prague. The next ballet performance Swan Lake will be played on 23th., 30th. of November and 2nd.,7th. and 14th. of December 2018 in Theatre Hybernia. Ballet The Nutcracker will be played on 2nd. of December and during Christmas 2018 in Theatre Hybernia. 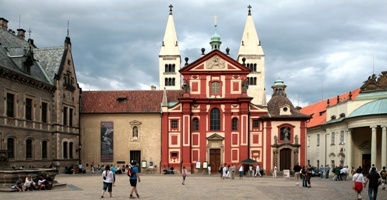 Enjoy Classical concerts in St. George's basilica in Prague Castle, church is actually dates back to 920, making it the oldest in Prague and the oldest surviving building in the Prague Castle complex. The classical concerts at Prague Castle st. George basilica in November and December 2018 are every Saturday from 5.30 p.m and every Tuesday, Thursday and Sunday from 4.30 p.m. Classical concerts in Prague Oldtown´s church St. Martin on the Wall are every Monday, Friday and Saturday from 5 P.M., in November and December 2018. For more information please call +420 224 224 706 or look to our play schedule. All performances presented at classicconcertstickets.com are organised by us. Tickets prices are same as the tickets purchased at our tickets offices in Prague. There are no added fees. After payment you will receive E-Voucher and confirmation of payment. If you not receive E-Voucher please use your confirmation of your payment from Ceska Sporitelna as your tickets, confirmation you will receive just after successful payment. The payment confirmation you can exhange for tickets in our box offices prior the performance. Theatre Hybernia box office is open from 10 a.m. until performance beginning and iis located on the left side of main entry. Prague Castle - St. George basilica box office is open every day from 10 a.m. till 16.00 p.m.